David Jeffrey’s status as the most decorated manager in any modern Irish League dug-out would suggest a level of familiarity with the pressures provided by Cup Final Week. His personal haul after Saturday’s League Cup final whistle now stands at 32 prizes in charge of Linfield and Ballymena United teams. Only Roy Coyle, the current director of football at Glentoran, can boast a better trophy tally. In the post-match scramble for reaction, the views of Jeffrey proved a priority as everyone wanted to hear his take on taking Ballymena United to a landmark trophy win around 11 months after accepting the role at a club fighting relegation fears. However, Jeffrey stepped into the spotlight then immediately turned the attention on to other key figures - in particular, one special fan. “A member of our first-team staff, David Douglas, previously alerted myself and my assistant, Bryan McLoughlin, to Trevor Burns,” said Jeffrey. “Trevor has missed something crazy like two or three games in 58 years as a Ballymena fan but has been ill.
“We went to see him a few weeks back and Trevor made it clear that, regardless of illness, he would be at the final. “Trevor was at Seaview with his family and I was able to bring the trophy over to him after the match. “We would like to dedicate our win to Trevor Burns. 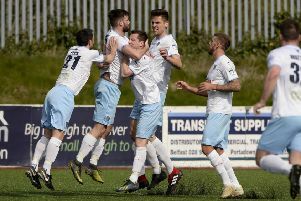 Ballymena secured the prize at the expense of Carrick Rangers following a first-half finish from veteran Allan Jenkins and three steps to heaven by substitute Conor McCloskey to pick up a pass, control it and confirm the club’s grip on the prize with a decisive second goal. Jeffrey’s first reaction at the final whistle was to embrace long-serving assistant McLoughlin. “People talk about David Jeffrey winning this or that but David Jeffrey does not win anything,” said Jeffrey. “It is a partnership with Bryan and he is an incredible part of what we do. “Everything achieved has been done with Bryan, together with being blessed by fantastic footballers. “I cannot begin to tell you how proud Bryan and I are of this fantastic group of players. “We came here wanting to give players an opportunity and told everyone only to sign up if they could give us 110 per cent as it would be very demanding. “This group is so hard-working and modest. “I was actually more nervous last Sunday than at any time I can remember before a cup final, because the people of Ballymena have been so supportive and I realised I wanted so much to win it for them. “We trained at Seaview on Tuesday with a really intense session and had another good night back in Ballymena on Thursday, so that helped me with the nerves as I knew the preparations had been good. “Then it was about trusting the players and so I was actually quite calm on the line. “I am so passionate about the Irish League and wanting our product to be projected well in front of everyone, especially with the Sky Sports television cameras at the game.